Besides the previously discussed Google earnings, which beat the highest estimate and sent the stock to a new all time high, investor mood was boosted after China unveiled a package of fiscal policies on Monday to boost domestic demand amid growing concerns of slowdown resulting from trade war, which sent Chinese and Asian stocks sharply higher. According to a Chinese government statement, fiscal policy should now be “more proactive” and better coordinated with financial policy, a signal that the finance ministry will step up its contribution to supporting growth alongside the central bank, and the likely outcome of the "war of words" that we previously noted had recently erupted between the Ministry of Finance and the PBOC. The measures which were announced late Monday following a meeting of the State Council in Beijing, include everything from a tax cut aimed at fostering research spending to special bonds for infrastructure investment, and are intended to form a more flexible response to “external uncertainties” than had been implied by budget tightening already in place for this year. Specifically, the fiscal package contained measures that included giving an additional tax cut of 65 billion yuan ($9.6 billion) to companies with R&D expenditure, expediting non-budgeted special bond sales to assist local government infrastructure financing and easing restrictions on banks’ issuance of financial bonds for small firms. Private investment would be boosted by introducing projects in transport, gas, and telecommunications, local governments will be pushed to make better use of untapped fiscal funds, and policies to attract foreign businesses to re-invest will be improved together with further opening up. The meeting reiterated language that China will strike a balance between easing and tightening and keep liquidity “reasonable and sufficient.” It also pledged to improve the transmission of monetary policy, a phrase the PBOC had dropped since a campaign to curb credit growth started in late 2016. As Bloomberg reported, Nomura said the statement signals “the start of fiscal stimulus,” Guotai Junan Securities Co. said it “confirmed the easing bias in monetary policy,” and Deutsche Bank AG views it “as a confirmation of policy stance changing toward loosening.” Standard Chartered said policies will be slightly looser to support domestic demand but that there is no intention to introduce large stimulus. The news was cheered by Chinese stocks, as the Shanghai Composite rose 1.6% enjoying its best three-day jump since 2016, Shenzhen rose 1.5%, Hang Seng up 1.6%, and the ChiNext index rose 0.5%. At the same time, with China putting deleveraging on the back burner and confirming it will pursue aggressive easing both fiscally and monetarily, China’s offshore yuan tumbled to the lowest levels in a year after the PBOC injected a record amount of funding into the banks via the MLF facility, the USDCNH rising as high as 6.8401, and the CNY fell as much as 0.65% to 6.8295 per dollar, the lowest since June 2017, before paring some of the drop. "The big story is that the Chinese currency continues to slide,” said Societe Generale FX strategist Alvin Tan. “It is clear the government is moving towards policies that are supporting growth,” he added saying the trend was likely to bring a reaction from the United States in time. Meanwhile Chinese government bonds fell with the yield on 10-year sovereign bonds climbing 5bps to 3.57%, the highest in almost a month. The State Council meeting, especially guidelines about encouraging investments and ensuring corporate financing, "is helping the risk appetite to recover and damping demand for government bonds," said Linaxun Securities chief macro researcher Li Qilin. Elsewhere in Asia, the MSCI Asia Index rose 0.6% in sympathy with Australia's ASX 200 (+0.6%) and Nikkei 225 (+0.6%) were higher with strength seen in financials especially in Japan amid ongoing speculation the BoJ could tweak its policy settings next week, considering that the central bank’s current prolonged ultra-easy policy is viewed as a dampener on Japanese bank profits. 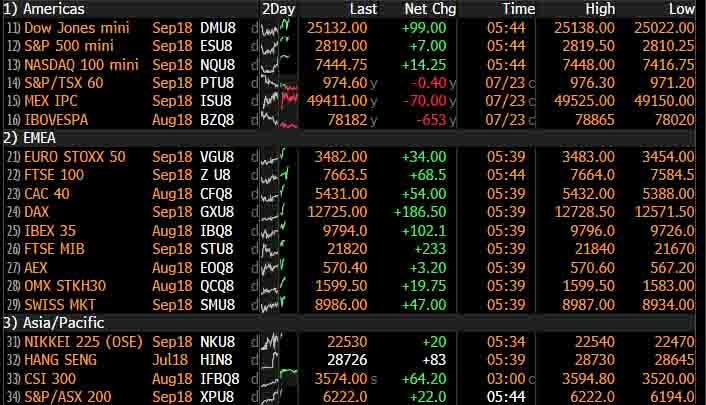 European stocks were also up, thanks to upbeat results from UBS, autos firm Peugeuot (+10%)and chipmaker AMS but also riding in the slipstream of Asia’s and Wall Street’s overnight gains. Carmakers and banks were among the biggest winners in the Stocks Europe 600 Index, as PSA Group said subsidiary Opel turned a profit and lender UBS Group AG posted better-than-forecast results. The Stoxx 600 Index was up 0.9%, rising to the highest level in 5 weeks, helped by a stronger than expected Markit manufacturing PMI of 55.1, vs the 54.6 expected, even as the Service PMI missed and dropped from 55.2 to 54.4. Across the Atlantic, S&P500 E-Mini futures rose 0.2%, while tech stocks got a boost from Alphabet which jumped 3.6 percent after hours to a record high, valuing the company at $870 billion. At the same time, global bonds remained under pressure on speculation the Bank of Japan may soon trim its massive stimulus rising Japanese interest rates on the long end, raising worries that Japanese investors would have less incentive to hunt offshore for yield, said ANZ economist Felicity Emmett. "The 10-basis-point steepening in the Japanese yield curve is massive in the context of a market that rarely moves more than 1 basis point,” she said. “It reflects a broader fear that central banks are reducing their purchases while U.S. bond supply is set to rise significantly." Overall, bond markets showed muted moves with Treasuries edging higher one day after 10-year yields reached their highest in five weeks, 2.96% while Germany’s government bond yields rose to a five-week high of 0.416 percent. Most other euro zone yields were higher by 1-3 basis point. Gilts slid for a third day before a debt sale. Part of the shift in yields was caused by talk that data on second-quarter U.S. economic growth, due on Friday, would top current forecasts of 4.1%. Dealers noted some media reports that President Donald Trump was predicting an outcome of 4.8% . That would not be out of bounds, given the much-watched Atlanta Fed GDP tracker puts growth at an annualized 4.5 percent. Such a strong outcome would only add to the risk of faster rate increases from the Federal Reserve and underpin the dollar. In commodity markets, oil prices were flat as the focus turned to oversupply worries and away from escalating tensions between the U.S. and Iran. Earlier today, Iran said it will respond with equal countermeasures if the US attempts to block its oil exports. Gold is trading flat following the pullback from the dollar. In base metals, London copper rebounds on supply concerns following a deadlock at the world’s largest copper mine in Chile where Unions stated negotiations with management have broken down while an agreement before next week does not seem likely. Expected data include Markit US Manufacturing PMI and Richmond Fed Manufacturing Index. Harley-Davidson, Kimberly-Clark, Lockheed, Verizon and AT&T are among companies reporting earnings. Asia equity markets gained across the board following the mostly positive performance of their counterparts on Wall St where financials outperformed amid rising yields and Nasdaq 100 futures were boosted after-hours following earnings from Alphabet. ASX 200 (+0.6%) and Nikkei 225 (+0.6%) were higher with strength seen in financials especially in Japan amid ongoing speculation the BoJ could tweak its policy settings next week, considering that the central bank’s current prolonged ultra-easy policy is viewed as a dampener on Japanese bank profits. Hang Seng (+1.5%) and Shanghai Comp. (+1.6%) led the gains in the region with sentiment underpinned after China announced further measures on Monday to support demand including a tax reduction targeting research spending, bonds for infrastructure investment and a more proactive fiscal policy. Finally, 10yr JGBs were initally marginally higher on short-covering following recent declines, although the rebound in prices was later reversed amid softer 40yr auction results and prospects of a BoJ policy tweak. European equities extend gains (Stoxx 600 +0.8%; at 5-week highs) seen at the cash open following an upbeat Asia-Pac session and slew of large-cap earnings. Peugeot (+10%) sits at the top of the CAC post-earnings, in sympathy this has helped support auto names across the continent with the German carmakers helping the DAX (+1.4%) outperform its peers. Sentiment for the sector has also been bolstered by US President Trump stating he wishes to work something out with the EU regarding trade and that he is ready to do something regarding auto imports from the EU. Sector wise, Material names outperform on the base-metal rebound while Financials are boosted by UBS’ (+3.2%) strong post-earnings performance, lifting fellow financial names such as Commerzbank (+2.9%) and Credit Suisse (+2.7%). In FX, the DXY was Firm, but off best levels as the index consolidates within a 94.535-865 range after another rise in tandem with higher US Treasury yields and ongoing Yuan depreciation. Note, the PBoC fixed the Usd/Cny mid point considerably higher today, resulting in the on-shore unit closing at its weakest level (6.8100) since the end of June last year, while the Cnh has fallen below 6.8400. However, rebounds in other currencies on several more specific/independent factors have nudged the Greenback down from its overnight peaks. GBP/JPY/NZD - All now marginally firmer vs the Usd, with Cable crossing 1.3100 again ahead of the latest CBI industrial trends survey, the Jpy nestling midway between 111.05-50 parameters after reports of exporter offers for month end (plus persistent hawkish BoJ spec) and the Kiwi retesting psychological resistance around 0.6800 before NZ trade data later tonight. EM - TRY and HUF in focus given CB policy meetings today, and the Lira looking for further tightening from the CBRT to keep its recovery momentum going (Usd/Try pivoting 4.7500 at present). Commodities traded fairly mixed with WTI and Brent off overnight lows as they breach USD 68.00/bbl and USD 73.00/bbl to the upside respectively in an attempt to nurse yesterday’s losses. Earlier today, Iran said it will respond with equal countermeasures if the US attempts to block its oil exports. This week, analysts are forecasting US crude stocks to print a draw of 3.5mln barrels, for distillates a build 0.2mln barrels and for gasoline a draw of 0.8mln barrels. Elsewhere, gold is trading flat following the pullback from the dollar. In base metals, London copper rebounds on supply concerns following a deadlock at the world’s largest copper mine in Chile where Unions stated negotiations with management have broken down while an agreement before next week does not seem likely. After all the excitement following the various headlines at the back end of last week, the last 24 hours has proven to be fairly tame by comparison. That said bond markets have replaced equities and currencies under the spotlight for now with curves bear-steepening across the globe yesterday. Indeed the BoJ now appears to have started to influence the back end of yield curves with next week’s policy meeting looking like a much more interesting affair with the market debating the prospect of a possible tweaking in policy. In conjunction with President Trump’s recent comments about the Fed, the 2s10s Treasury spread widened by 2.3bps by the end of play last night to 32.1bps, taking it to the widest since June 29th. This is also the biggest two-day steepening for 2s10s (7.6bps) since February 2nd and just prior to the vol spike. It’s worth also noting that 10y Treasuries finally snapped out of the 22-day run yesterday in which they had closed with a 2.8% handle. The intraday range in that run was also just 9.3bps, so it was probably about time we saw some volatility again. Meanwhile 2s10s Bunds were 1.9bps wider after 10y yields rose by 3.6bps to close back above 0.400% for the first time since June 15th. Curves were also steeper in France and the UK. Equity markets on the other hand were much more of an afterthought yesterday with the S&P 500 limping to +0.18% gain albeit with volumes below average and an intraday range of less than half a percent. Steeper curves did however give a big boost to financials with the sector rallying +1.32%. Interestingly after financials fell -5.85% and for 13 sessions in a row back in June, the S&P 500 Financials sector is now back to within less than half of a percent of where it was prior to that losing run starting. Meanwhile the NASDAQ also closed +0.28% last night to snap a three-day losing run, while in Europe the Stoxx 600 closed -0.19% part which is the first time that we can say that for a while. This morning in Asia, equities have taken an extra leg up with gains led by bourses in China after China’s State Council unveiled pro-active measures to aid growth (more on that below). In terms of the moves the Shanghai Comp and CSI 300 are +1.59% and +1.71% respectively, while the Hang Seng (+1.49%), Nikkei (+0.59%) and Kospi (+0.49%) have also benefited. China’s Yuan was as much as -0.45% weaker and touched an intraday high of 6.829, but has now settled just above 6.80. Meanwhile, after the bell in the US, Alphabet jumped +3.6% after beating consensus expectations on its 2Q revenue and gross margins. S&P 500 futures are broadly flat. Finally, as for data, Japan’s July Nikkei manufacturing PMI eased 1.4pts mom to 51.6 (vs. 53.0 previously). Coming back to that China news, yesterday our China Chief Economist Zhiwei Zhang published a note summarising yesterday’s State Council meeting. Zhiwei notes that the government decided to make fiscal policy more “proactive”, and keep liquidity conditions “reasonably adequate”. The government also reiterated that they intend to avoid aggressive loosening like the “4tn” stimulus China rolled out in 2008/09. Significantly, Zhiwei takes the statement as a confirmation of the policy stance changing from tightening toward loosening. The change of monetary stance has already happened in Q2 with the RRR cut and injection of liquidity through MLF and the new message from the meeting yesterday is that fiscal policy will become incrementally more expansionary. Looking ahead to today, following Japan’s reading this morning we’ll also get the flash July PMIs for Europe and the US which will be the latest test of the global growth impulse. For the Eurozone the consensus is for a small retreat in both the manufacturing (-0.2pts to 54.7) and services (-0.1pts to 55.1) prints. As a reminder the Eurozone manufacturing reading has fallen every month in 2018 so far and is currently at the lowest since December 2016. The composite is expected to only fall a modest 0.1pts to 54.8 so the broad expectation is for some stabilisation in the PMIs. In the US this afternoon the manufacturing and services readings are also expected to soften, the former by 0.3pts to 55.1 and the latter by 0.2pts to 56.3. In terms of yesterday’s data, in the US June existing homes fell for the third straight month to 5.38m (vs. 5.45m expected, -0.6% mom). Elsewhere the June Chicago Fed National activity index was above market at 0.43 (vs. 0.25 expected). Over in Europe, the July Euro area’s consumer confidence index was slightly better than expected at -0.6 (vs. -0.7) and steady mom. As for some of the latest Brexit headlines, on his first visit to Berlin after becoming the new British Foreign Secretary, Jeremy Hunt noted the UK will not “blink” in Brexit negotiations while warning that “without a real change in approach from EU negotiators, we do now face the real risk of a no-deal by accident….” His German counterpart Heiko Maas noted “we don’t want a disorderly Brexit, we want an agreement”. Meanwhile opposition Labour leader Jeremy Corbyn is expected to unveil his vision for a new customs union with the EU today which seeks to boost manufacturing and keep public contracts in Britain. Elsewhere the UK’s Supreme Court will decide over the next two days on whether the Scottish bill is constitutional or not. Bloomberg noted the bill seeks to preserve devolved powers when EU law is converted to British law, which could allow PM May to impose British sovereignty on the will of the Scottish Parliament post Brexit. Looking at the day ahead, as mentioned earlier the flash July PMIs across the globe will be due, including the manufacturing, services and composite PMIs for France, Germany and the Eurozone. The US PMIs will then be out in the afternoon. Away from that data, we'll also get July business and manufacturing confidence prints for France, CBI selling prices data for the UK for July, and the July Richmond Fed manufacturing index in the US. Earnings wise, Verizon, AT&T and Harley Davidson are due to report. Meanwhile the EIA will release its 2018 International Energy Outlook report later in the day.